India is the seventh largest country with second largest population cover in world, and mosquito stand s as one of the largest disease spreading agent. More than 1 million people die from mosquito-borne diseases every year in country, and hundreds of millions more experience suffering and pain from illnesses transmitted by mosquitoes. Dengue fever chikungunya, yellow fevers are some of the main diseases suffered. As we all know “Precaution is better than cure” so here are we introducing some of the top 5 Best mosquito killer brands from India. As a Brand product of Godrej India, Goodnight stands as a well known brand in Indian market keeping mosquitoes at bay. It offers various products in different forms and base like cream, spray, repellent, coil, etc. 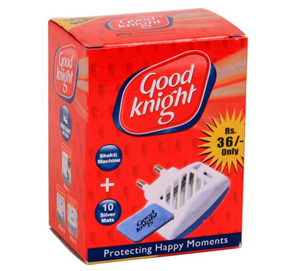 Goodknight became the first to mark its name by introducing World’s 1st low smoke coil that emits 80% less smoke and is 25% more effective than any other coil. Mortein is a brand of household insecticide. Mortein’s famous tagline is “More smart, more safe, Mortein.” This brand deals with various gulfs of products, from which some of them are Automatic Insect Control System, Fly Sprays Area Repellents, Crawling Insect Sprays (Indoor), Cockroach Baits and Rodenticides as well as coils and different exclusive spray for mosquito destruction. 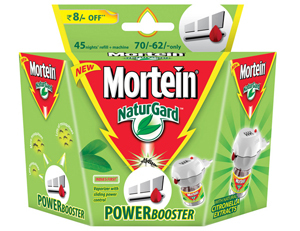 The best product for mosquito in this brand ie; Mortein NaturGard contains Citronella Oil which is a natural repellant of pests. Citronella is also known as lemon grass and has a great fragrance. Now no more worries in dealing with mosquitoes, keep them at bay with the latest range of mosquito repellants. ALLOUT brand products vary from coils to some very famous liquid electrics to continuously protect you and your family from bothersome, buzzing mosquitoes. This brand’s name hails from the popular sport of cricket! And hails valuable experience of so, in Indian market from around 20 years. 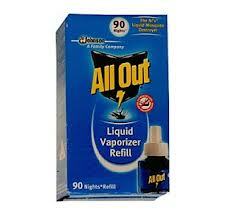 ALLOUT even offers the best protection and also takes the worry out of pest control. Well known mosquito repellent cream in Indian market. It is a product of Dabur. It is a clinically proven brand of mosquito repellent that offers the most effective protection from mosquitoes. 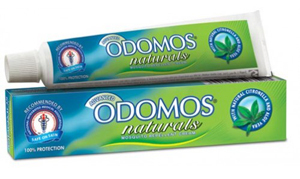 Clinically tested and certified Odomos claims to be the best protector against mosquito bites for as long as 12 hours. Mosquitoes detect you by the odours that your body emits. By the new formula new advanced Odomos masks the distinctive body odour that human skin emits making you virtually invisible to mosquitoes and offers 100% protection against mosquito bites. As per its name it helps in fully making mosquitoes vanish from everywhere around after its presence. 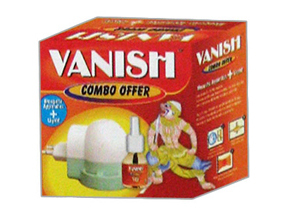 Vanish offers mosquito killer and mosquito bat for its valued customers. As mosquitoes, even in dark, can easily locate any person. By sensing the carbon dioxide and temperature that is shed by human body from time to time to maintain temperature levels. Also, they react extremely sensitively to near ultraviolet Light. Using these characteristics of mosquitoes, Vanish- mart photo catalyst mosquito trap can decoy and capture mosquitoes in Dark indoors. It does not require any exchange of Chemical and is completely eco friendly and Safe.